See what the Smash Pages’ staff enjoyed reading this past year. With 2018 winding down, Smash Pages’ contributors take a look back at some of their favorite comics of the year, from Hey Kiddo and Spectacular Spider-Man #310 to Wet Moon and The Secret Voice. Arakawa is best known as the creator of Fullmetal Alchemist, but you couldn’t get any farther from that series than Silver Spoon, a comedy about a city boy who goes to agricultural school in rural Hokkaido. Yuugo Hachiken worked hard and did everything he was told, but he still didn’t get into an elite high school, so he takes what he thinks is the easy way out by going to a school that’s not academically focused—or so he thinks. In fact, the students at Ooezo Agricultural High School are very knowledgeable in their fields, but those fields are things like genetics and animal husbandry. The rubber really hits the road in the practical lessons, though, and Hachiken quickly realizes he is out of his depth when it comes to herding chickens, riding a horse, or fetching a stray calf. There’s a lot of city mouse-country mouse comedy in this series, but it’s also a fascinating look at where our food comes from (at least in Japan), and the different agricultural models espoused by different farmers. In fact, like Hachiken’s classmates, this book is very smart and sophisticated in addition to being endlessly entertaining. The idea of eating bugs may elicit an “Eeeww” from most people, but Delliquanti and Ho go beyond the ick factor in this romance about an insect cuisine enthusiast and a chef who wants to start a new restaurant based on the dishes of her youth—dishes that include ants, grasshoppers, and tarantulas. There’s a love story woven in there as well. Yarrow has just moved to a new city in hopes of getting a job in the kitchen of Chandra Flores, insect chef extraordinaire, who is about to launch a new restaurant. Milani, her neighbor, is friendly and helpful but the two have a little trouble making it click. At the same time, Chandra suspects that Yarrow is only into insect cuisine because it’s sensational, while to her, it’s part of her heritage. There’s a lot in this slim volume: Love, food, bugs, and bugs that are food, and the creators even include a couple of recipes at the end of the book. BOOM! Studios will relaunch ‘Buffy the Vampire Slayer’ in January in stories set at Sunnydale High. Following the announcement that BOOM! Studios obtained the license to Buffy the Vampire Slayer, the publisher announced this weekend that writer Jordie Bellaire and artist Dan Mora will work with Buffy creator Joss Whedon on the title. Buffy and the gang follow ‘Firefly’ from Dark Horse to their new home at BOOM! Studios. After about two decades at Dark Horse Comics, the Buffy the Vampire Slayer license has moved to BOOM! Studios. The move isn’t too surprising, Buffy creator Josh Whedon mentioned that Fox was taking back the Buffy license this past summer in an interview with CBR’s Kiel Phegley. BOOM! announced they had the Firefly license, also a Fox property, not long ago, and Fox has a minority stake in BOOM!. Company announces “Season 11” by Christos Gage and Rebekah Isaacs. 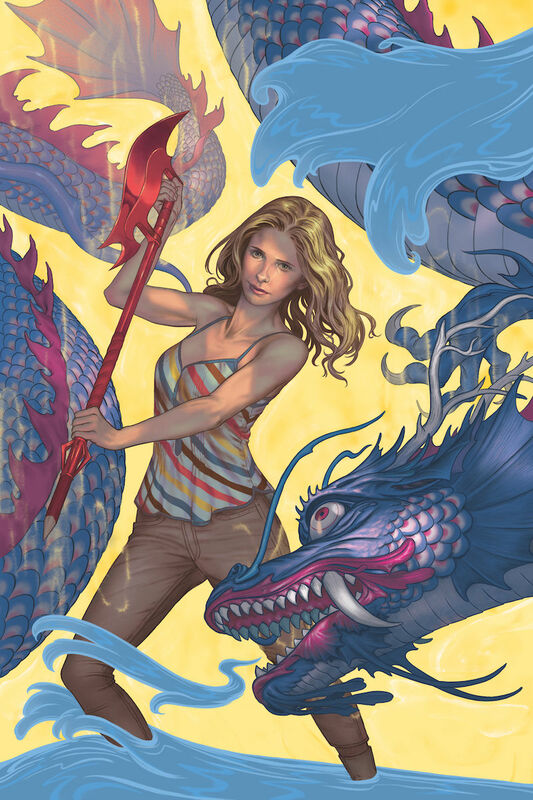 Joss Whedon’s “Buffy the Vampire Slayer” will continue to slay the undead courtesy of Dark Horse Comics and under the guidance of writer Christos Gage and artist Rebekah Isaacs. With Comic-Con International starting tomorrow, Dark Horse announced “Season 11,” which will run for 12 issues starting in November.